Mongul Mingghan Commander Uriyan Edei proposes that they use their shintenrai (震天雷 “heaven-shaking thunder”) hand cannons against the defenders to reduce casualties among his men. From a distance, Teruhi and Harari try to shoot him with their bows but fail. Jinzaburō and Abiru’s group prepare to withdraw, but suddenly Chinese soldiers ,in the Mongol army, shoot Abiru with a shintenrai, killing him. Meanwhile, the Goryeo troops from Sasu begin to approach from the west. Jinzaburō hopes the two different armies will be confused when they meet in the fading light. When the Goryeo and Mongols meet they start fighting over valuables left behind by the fleeing islanders, allowing the defenders to escape north. That night, Teruhi and Jinzaburō are approached by an old man who is with the Toibarai. Jinzaburō follows him through the night, and at dawn finds himself on the peak of Mt. 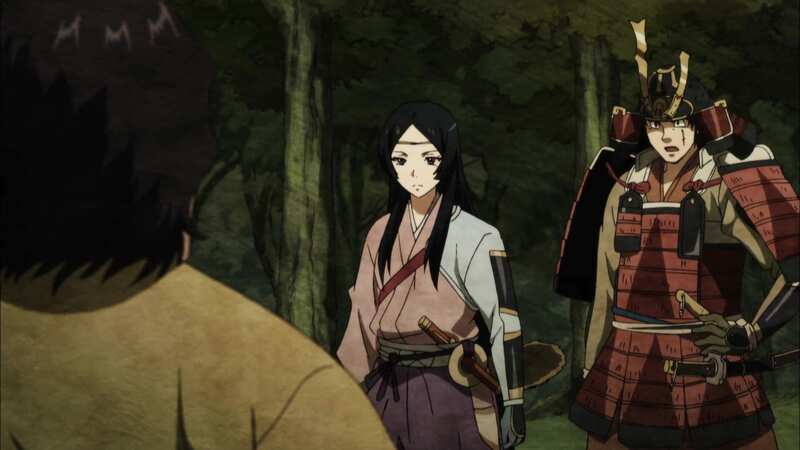 Shiratake and is introduced to Tokihito, known as the Emperor Antoku.